The CATBI website was designed, in part, to develop a model for Independent Living Centers (ILCs) to provide appropriate, accessible services to TBI survivors, including veterans. Thank you to all who participated in our Statewide Webinar Series on TBI : Veteran Culture & VA Service Coordination Webinar. The purpose of the webinar was to Fostering collaboration and cross referral between VA and community organizations to better serve the unique needs of veterans, veterans with TBI and multiple disabilities. On the three webinars, we had various individuals representing the Department of Rehabilitation throughout the state, Independent Living Centers, TBI Service Sites, Community Colleges, Veteran Service Organizations and countless others joining in. Currently, California has over 2 million veterans living in the state, with another 30,000 returning being discharged every year. Many are coming back with TBI, PTSD, and poly-trauma. The State wide webinar touched on several different points to better serve our veterans on a statewide level. Brock McNabb and Jeremiah Ridgeway, Readjustment Counseling Specialist with the U.S. Dept. of Veterans Affairs touched on Veteran Culture. Both made the point to say, that in order to serve veterans, one must understand the culture, values, language and mentality that they lived by as well as the life experiences they have witnessed that separate them from the Civilian Sector. Once that understanding is made, then the process or assisting in reintegration becomes possible. Dr. Cynthia Boyd, a Neuropsychologist and Co-Senior Scientific Director of the Defense and Veterans Brain Injury Center at Naval Medical Center San Diego presented on What is Unique about Veterans w/ TBI. Dr. Boyd elaborated on the difference between severe, moderate and mild TBI. She also touched on the distinguishing characteristic of TBI, PTSD, chronic pain, medication and substance abuse as many of these can have overlapping characteristics. Laura Gomez and Alfonzo Molina, from the Department of Veteran Affairs Palo Alto Care System under OEF/OIF/OND Programs. Both spoke on Service Coordination: VA Services and System, what the process is for most vets, what resources are in the community already and how service organizations could fit in. Finally, Chris Lopez, Former Readjustment Counseling Specialist with the U.S. Department of Veterans Affairs and presented on Veteran Outreach and collaboration . Chris presented a veteran perspective of TBI. He severed in the U.S. Army as an infantryman and was medically retired after he was wounded with a TBI and back injury in Iraq in a fire fight. The webinars have been archived on our website at http://catbi.org/media.html#archives. If you have any follow up questions regarding the webinars, please contact Crystal Loutzenhiser at cloutzenhiser@cccil.org. Central Coast Center for Independent Living is hosting the second in a series of webinars. This webinar will facilitate collaboration between Independent Living Centers, Traumatic Brain Injury sites and community partners including veteran service providers and community colleges. This is made possible through an ARRA-funded grant (economic stimulus) administered by the Department of Rehabilitation. Webinars will be regional for Southern, Central and Northern California. The second set of webinars - Veteran Culture & VA Service Coordination will be held in April 2011. Webinars will be regional to facilitate collaboration with regional ILCs, TBI Sites, DoR staff and community partners. You are strongly encouraged to attend the webinar in your region. Please register to participate in this webinar. Click http://tinyurl.com/TBIStatewideWebinar to register. You will receive a confirmation and log in information. Brain Injury Awareness Month was established to raise awareness of Brain Injury and to advocate for timely trauma care, rehabilitation and lifelong services for those who are living with a Brain Injury, their families and care givers. This year there are several events being planned to raise awareness. BIAA along with the Congressional Brain Injury Task Force are teaming up to host a Brain Injury Awareness Day on Capitol Hill on March 16th. The focus of this year’s event will be on rehabilitation and re-entry into the community after brain injury. BIAA is also working on a nationwide public service and advocacy campaign of 'A concussion is a brain injury'. Get the facts' through radio and print ads like the one to the right. The campaign aims to educate the public, educators and law makers about sport related brain injuries, especially among children and student athletes. Locally, Brain Injury Association of California will also be hosting 4th Annual Statewide Walk For Thought throughout the month of March. Walks will be in various locations, including Fresno, Bakersfield, Visalia, Chico, Oxnard, San Diego, San Jose, Sacramento and San Francisco. The goal, to raise awareness of BI and the needs for persons who have sustained an injury, provide resources and provide prevention materials. There are many ways for you to participate and get involved! Even just talking to your friends, neighbors and family about brain injury, helps to raise awareness of this disability, one person at a time. Thank you for being a part of raising awareness for Brain Injury. This was an impactful, fast pace look at what veterans face when they are trying to reintegrate into civilian life and the community. The begining of the play starts in tribute to the title, Into the Fire. Monterey Peninsula College, the college hosted Had To Be Productions: Into the Fire as part of their in service training for their faculty and staff, in order to address the more than 600 veterans attending the local community college. The documentary theater featured actors Carrie Gibson and Anthony Curry, reenacting the interviews and stories of eleven veterans with disabilities and their families. Carrie Gibson and Anthony Curry performing Into the Fire. Click on picture to link to their website and to watch a sample of the production. Carrie: "The average number of rounds shot in any firefight is 33-hundred." Anthony: "That's a lot of bullets flying. So you can't expect us not to be reactive. People have been shooting at us and we've been shooting back." Carrie: "When they shoot at us, we don't duck and cover." "We walk, into the fire." When a soldier is being fired at, moving toward the shooter is actually the safest thing to do. So, instead of walking away, they walk “into the fire.” This training veterans had, that was essential to survival in the military, leads into many of the misunderstood habits caused by the hidden psychological impact that war when they are reintegrating into society as veterans. At the end of the production, Carrie and Anthony provided a workshop to reflect on the message and emotions brought up in the performance followed by a panel discussion by veteran students attending the college. 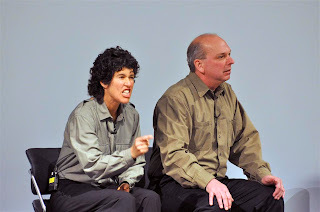 This was the first time these performers presented at an all faculty event. The faculty seemed receptive to learning more about veteran culture and how to create the space in their classrooms and learn about resources and strategies to veterans "come all the way home." One such person from the disability community was Ed Roberts. Roberts contracted polio as a teenager and relied on a respirator to breathe. He is known as the "Father of Independent Living" because he founded the first Independent Living Center in Berkeley in the 1970s. He was the first student with significant disabilities to attend the University of California at Berkeley and later founded the Physically Disabled Students Program on campus. In 1975, he was named the director of the California Department of Rehabilitation and was instrumental in the implementation of regulations that established civil rights for people with disabilities. Roberts died in 1995. 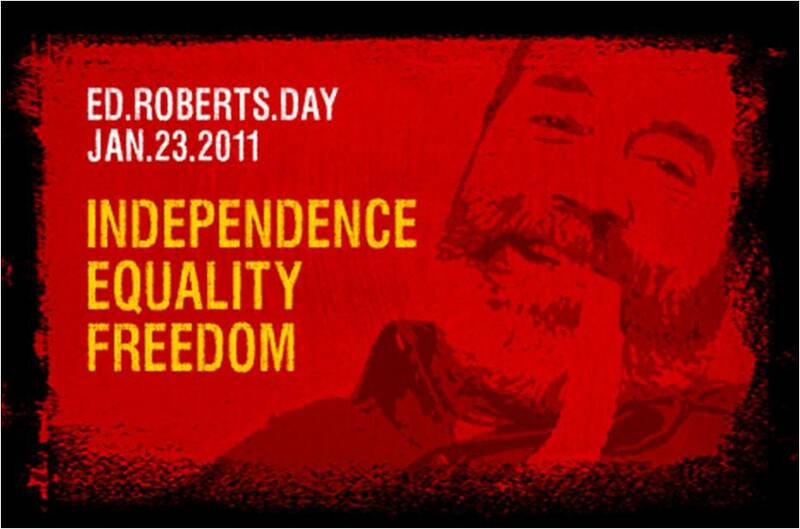 On Jan. 23, we will celebrate our first "Ed Roberts Day" in California. Recently, U.S. Rep. George Miller, D-Martinez, introduced House Resolution 1759 to declare the support of Congress for a national "Ed Roberts Day." The resolution was co-sponsored by Central Coast Congressman Sam Farr, D-Carmel, who has been a strong supporter of people with disabilities in our community. 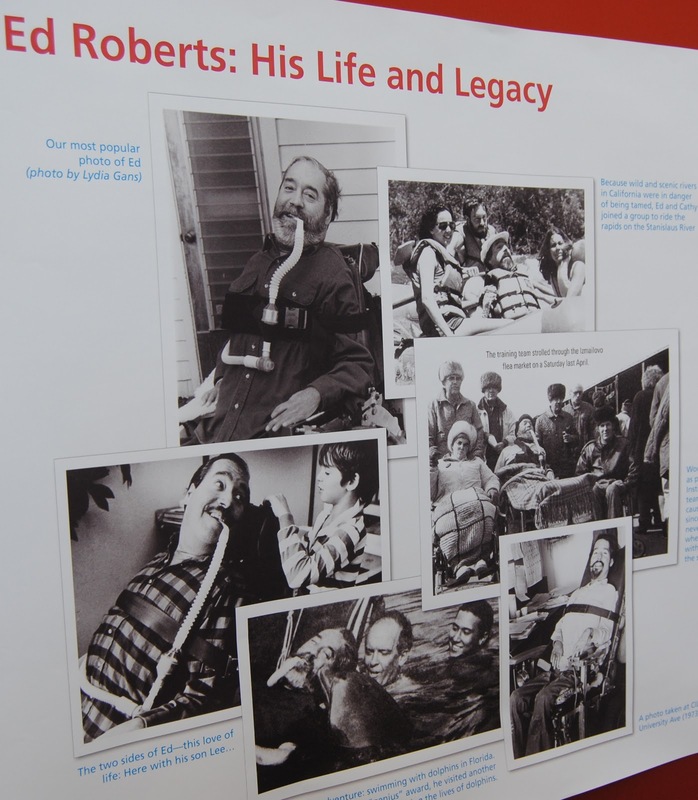 Roberts was more than an important figure in disability history. He did not find his way into this column because of his impressive resumé. For me, his legacy will be the way he approached his life and his philosophy toward other people with disabilities. When he was told he could not attend UC Berkeley, he fought until he was allowed to do it anyway. When no one expected him to marry and have a child, he did those things anyway. When very few people with disabilities worked, he found leadership positions and excelled anyway. He taught other people with disabilities that they had a right to make choices for themselves instead of having them made for them. His slogan, "Nothing About Us, Without Us" is a core value of the disability-rights field today. On Jan. 23, take a moment to recognize Robert's legacy. As people with disabilities, we have all been told what we can't do, but perhaps, like Ed, you can just do it anyway. In many ways, Ed Roberts parallels that of many those who acquire a traumatic brain injury and are left with a drastic change in how they will continue to live and navigate their lives. Ed Roberts life and legacy was essential not only to the disability movement of the past, and as he would put it, we are still "working toward our preferred future." Denika Boardman is the systems change coordinator for Central Coast Center for Independent Living. She writes a monthly column on "Disability Awareness" that appears in Opinion. For a person with a disability, it can be difficult to find role models or leaders to look up to. I think that's why having some understanding of disability history is so important. People look up to other people whom they know have had similar experiences — people they can relate to; people who have transcended their situation in life and taught society lessons that it needed to learn. 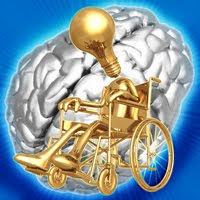 The online world are full of potential resources you can use related to Traumatic Brain Injury. There are a few that are worth highlighting. l Brain Line provides a wide range of information regarding TBI, from what TBI is, to informative videos and podcast, to headlines in the news, to resources for those with a TBI, caregivers and professionals. l CCCIL, in addition to being a Independent Living Center, is also one of seven TBI Service Sites in California. The mission of TBISCA is to ensure that adults with a traumatic brain injury have the necessary services to enhance self-sufficiency. TBI sites core services include, Information and referral, community reintegration, supported living, vocation services. We have a new update on the CATBI.org website. In a previous post we had updated posting the Expanding TBI Services Manual. The manual covers many aspects of our development of a model for California and strategies to build capacity to serve civilians and veterans with traumatic brain injuries (TBI). Another integral part of the manual is our Media Outreach Handbook. What we have just posted to our main page for reference and can be found on the home sidebar. This comprehensive handbook to aide TBI organizations in conducting media outreach was developed in a collaborative effort with the media-consulting firm, Paschal Roth Public Affairs. In the handbook, the concept of ‘earned media’ or publicity outside the realm of paid advertising. Also included are ways to create a story that will resonate with the press such as Role of the expert by providing a human element and including a human focus and responding to what is going on in the news. One of the more recent trends in media has been a shift in emphasis positive local, or community oriented stories. The handbook provides samples of a news advisory, press release, sample statement, news article and letter to the editor that have been generated throughout the project for reference. Hopefully, these will serve as a solid resource as another way to outreach for people with TBI through media. On Friday, December 3rd, will be the 29th annual observance of the International Day of Persons with Disabilities. This day was established by the World Program of Action concerning Disabled Persons, adopted by the United Nations General Assembly in 1982. This day was established to cultivate an increase level of awareness and understanding of disability issues in our global society with a focus on the rights of persons with disabilities. Part of this day is to advocate for the integration of persons with disabilities in every aspect of the political, social, economic and cultural life of their communities. The ultimate goal is to make it possible for those with disabilities to have full and effective participation in society. Many people who acquired a traumatic brain injury and live with subsequent disabilities were often those who were at the peak of their physical and cognitive abilities. For teenagers or young adult many receive their TBI from bicycle, motorcycle, and sports accidents. Cops, fire fighters and service men and women receive their TBI in the line of duty. Both groups left to face subtle and extreme differences and abilities, some having to learn how to walk and talk again. Many take time to cope with their acquired disabilities and work hard to make the most of their abilities. This coming year, on January 23rd, California will be celebrating the life of Ed Roberts who some deem the the “father of the independent living” movement for people with disabilities and special needs. Ed, who was a quadriplegic due to polio as a teenager experienced what many with a TBI find themselves facing. He used the challenges he faced by society to become a fierce advocate for the disability community. Although there is a ways to go for complete equality, these two days are milestones in the fight for equality for those living with disabilities and have paved the way for the services, awareness and laws we have today. As part of the Honor Independence Imagine Independence project, it is best to document the process as well as the results. The link below directs you to the updated Expanding TBI Service Manual listed on our main website. The manual serves as an accounting of the process used to increase capacity for independent living centers (ILC or CIL) to serve people who have had a Traumatic Brain Injury (TBI). This handbook covers best practices and components of providing services and outreach to people with a traumatic brain injury throughout California. Subscribe to the CATBI Blog. Copyright 2010 by CATBI.org. Simple theme. Theme images by tomograf. Powered by Blogger.